Braden Long earned first team MSL honors finishing as the second individual golfer overall in the MSL Buckeye Division. Jake King earned second team MSL honors, while both Austin Young and Nick Congrove were named honorable mention. 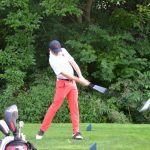 Wednesday, September 14, 2016 4:00 PM Teays Valley High School AWAY 181 Liberty Union High School HOME 173 Meet Recap Liberty Union defeated Teays Valley 173-181 at Pine Hill Golf Course. The Lions were led by medalist Nick Congrove (42); Braden Long (43); Austin Young (44); and Jake King (44).